Sky Sports TV presenter Jeff Stelling will be setting off on his eighth walking marathon in eight days from Sixfields Stadium in Northampton on Monday morning. Stelling is coming to the end of his epic ‘Men United March from Hartlepool to Wembley’, which involves him walking 10 marathons in 10 days in support of Prostate Cancer UK. 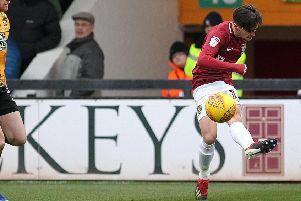 That is a total of 262 miles down the country, passing by a number of football clubs on the way, and on Monday he sets off from the home of the Cobblers before making his way to stadiummk in Milton Keynes. Stelling will be arriving at Sixfields at 7am, where he will enjoy a hearty breakfast, and then set off from Upton Way at 8am - and all are invited to head down and cheer the group on their way. Stelling and his team will then walk to the Coffee Pot Tavern in Yardley Gobion for a midday lunch, before setting off again. They are scheduled to arrive at stadiummk at 4.30pm. The popular Soccer Saturday host set off from his home town of Hartlepool on Monday, and has since visited a host of towns and cities including Middlesbrough, York, Leeds, Doncaster, Scunthorpe, Rotherham, Sheffield, Chesterfield, Derby and Nottingham. On Saturday he is walking from Wolverhampton to Walsall, before spending his Easter Sunday walking from Coventry to Leicester. Then it’s Northampton to Milton Keynes on Easter Monday, before a walk from Luton to Watford on Tuesday, and the final stretch from Kingston to Wembley Stadium on Wednesday. Stelling is obviously not doing this on his own. He has been joined along the way by a host of football and sporting stars and celebrities, and booked in to join him from Northampton is town Olympian Derek Redmond - as well as Cobblers mascot Clarence The Dragon! Stelling’s walk’s charity partner is Carlsberg, whose brewery and head office is in Northampton. Carlsberg have been a long-term supporter of Prostate Cancer UK and are sending along 26 of their green-wearing employees on the journey. For the March they have already raised more than £4,500 - part of which Carlsberg will match after the event. The march is being undertaken to raise funds for the charity Prostate Cancer UK, and Stelling said: “For more than 20 years it’s been an honour and a privilege to host Soccer Saturday on Sky Sports. “For me, it’s the best job in the world. I’ve shaped moods, prompting celebrations and triggering despair in equal measure. “If its stats you are after I’m your man. You could say I can talk the talk, but when Prostate Cancer UK asked if I could walk the walk too, things suddenly got serious. “Last month Prostate Cancer UK warned that the number of men in the UK dying from the disease will soar unless urgent action is taken. “If the rising death trend continues, by 2026 prostate cancer will kill more than 14,500 men every year. However, they estimate that deaths could be cut in half if the key areas of improving diagnosis and treatment can be resolved in the next ten years. “Within that decade Prostate Cancer UK believes they will find the answers to make this disease something men and their loved ones no longer fear. I’ve met the scientists who pledge to do this and I can see how dedicated they are. But to do this we need to raise vital funds. “That’s why I’ve signed up for my Men United March.